The National Credit Card Center of the R.O.C. adopts an Intel® Xeon® processor E7 product family-based platform to build a top-notch data processing center that boasts high speed, stability, and easy maintenance. Established in 1979, the National Credit Card Center of... the R.O.C., Taiwan (NCCC) handles credit card processing, domestic liquidation, and collection of bill payments, as well as bonus calculation and card-related services. With its innovative and professional services, NCCC promotes diverse and convenient financial flows, enhances the quality of life for consumers, and stimulates the development of the economy as a whole. • Timely, reliable data exchange—complete verification of information and authorization process within the required period while ensuring data transfer process efficiency. • Meet business request demands—ensure high performance and a stable computing system to handle an enormous volume of business requests on tight deadlines. Meet data processing demands. Make use of best-performing CPUs with sufficient power to meet the demands of processing massive amounts of financial information in future operations. Read the full High-Speed Data Center Boosts R.O.C. 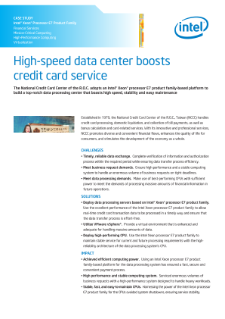 National Credit Card Center Case Study.